Who doesn’t love ube by now? Well if you’ve got ube halaya (jam) lying around, this is a great midnight snack or even breakfast choice. If the macapuno is too sweet an item, you can replace with a salty cheese like cheddar and it completely changes the dish but it will still be as good. Jackfruit is a great replacement for macapuno as well. In a bowl, mix together egg, milk, cinammon and nutmeg. Dip the bread slices in for 1 minute. Meanwhile, heat up a saute pan with butter and oil. Cook the bread slices until golden. Place on a cooling rack to cool a bit. 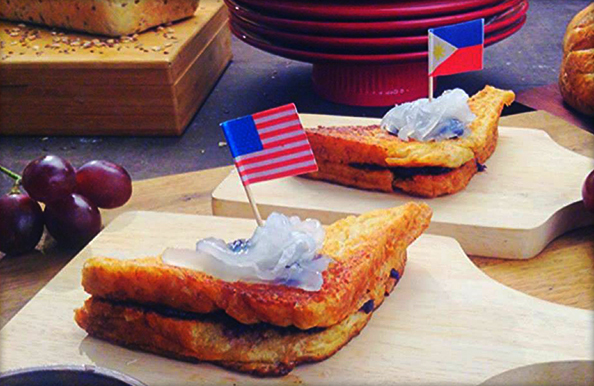 Spread the halayang ube onto each slice of bread and assemble the sandwiches. Spread the macapuno on top of the two slices sandwiches. Season the macapuno with some sea salt. Slice the sandwiches into two and serve warm.